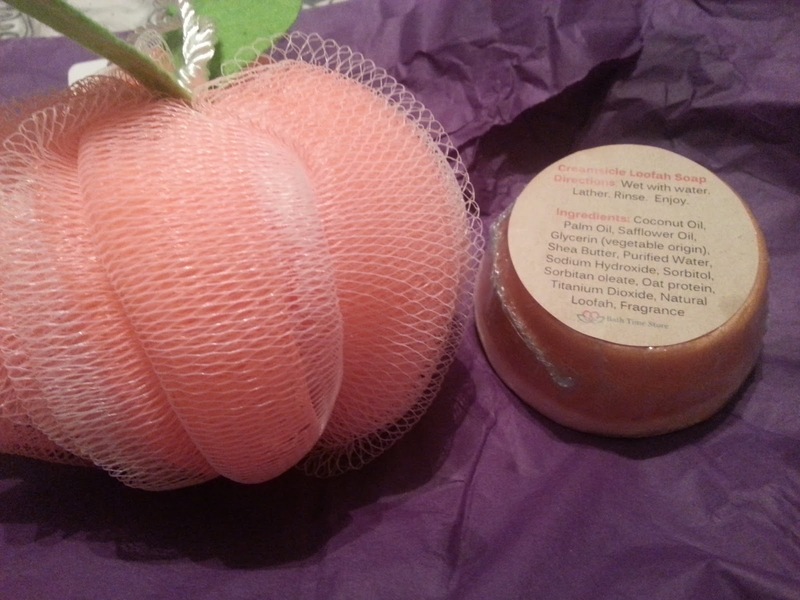 Deidre's Discoveries: Bath Time Box Winner! In the beginning of May, Cheryl at Lone Star Shopper had a review on the Bath Time Box, and a giveaway for any Canadian or American reader to win! I was very luckily chosen and I won the Bath Time Box for May 2015! Bath Time Box is a Canadian service which promotes Bath Time luxury, with all natural, and home made products! The box wax fairly long, and had colourful tape across it. I should have taken a picture. Anyway, the box contained 5 products, and a product info card! Dead Sea Salt Scrub - This scrub is a treat indeed! 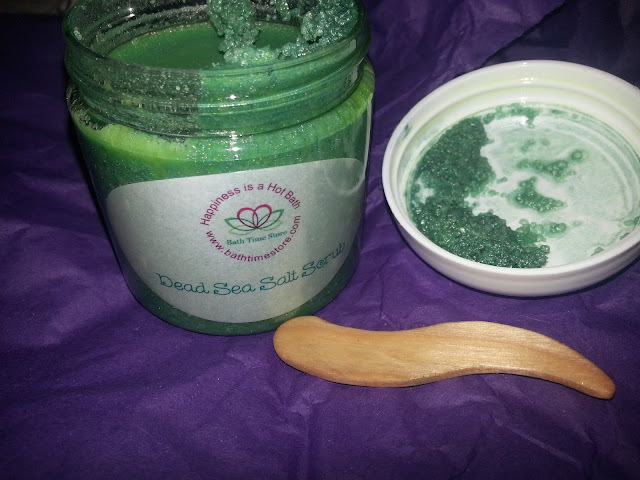 Dead Sea Salts blended with super loving oils with just a hint of Honeydew Natural Fragrance. Scoop some into your pouf and scrub away impurities. This stuff smells awesome! I've never really used a body scrub so it's new for me. I can't wait to try it the next time I'm in the shower! 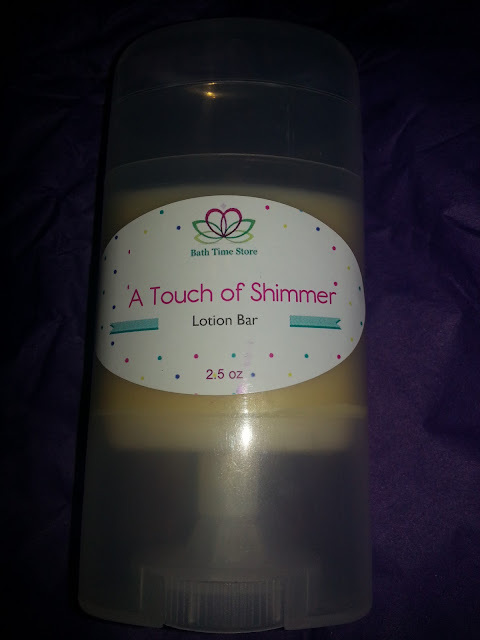 A Touch of Shimmer - Lotion Bar - Your skin will thank you for rubbing in this moisturizing lotion bar made from Cocoa and Shea butters with beeswax and other skin loving oils and a hint of coconut lime fragrance. I haven't opened this up yet because a lotion bar seems a little weird to me. I've never used one, so I'm debating between trying it, or gifting it! 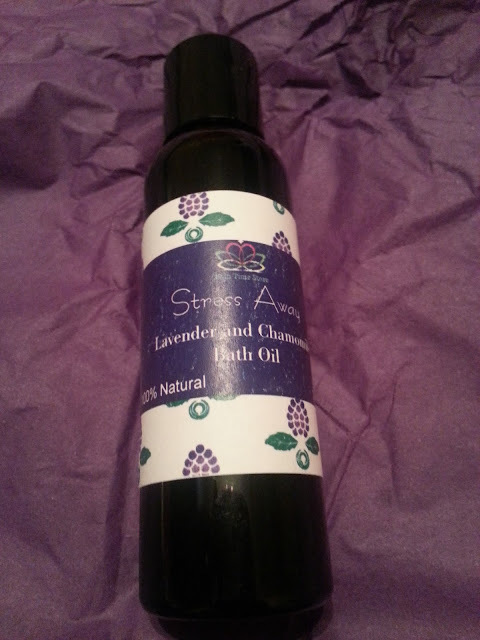 Stress Away - Lavender and Chamomile Bath Oil - Sweet almond and grape seed oil infused with calming chamomile and blended with lavender essential oils. Pour approximately 1 tbsp into your hot bath and use your new pouf to massage these skin loving oils into your skin or just soak and let them take away the day's stress. Again, something else I have never used but look forward to trying! Fruity Bath Pouf - This colourful jumbo pouf is a perfect accompaniment to all your scrubs and oils. I need a new pouf, so this came at a great time. It's a cute peach! Creamsicle Loofah Soap - Our glycerin soap with a delightful surprise inside; an all natural loofah slice, then topped with our super nourishing Shea butter soap. This smells great, and suds up really easily in the shower/bath. The only downside I feel is the loofah inside is quite rough. I like the idea of it because you can exfoliate and clean at the same time, but it hurt my skin a little! I enjoyed this box! And although I haven't tried some items, I can't wait to try them. It was awesome that this was free and that everything is homemade - you don't see that too much anymore! I would definitely consider purchasing a few months for someone as a gift if they love their bath/shower time! I'm glad you decided to enter my giveaway too - I love Bath Time Box! It is such a nice treat! The bath scrub smells soooo good!